This modern, well maintained and detached four bedroom home benefits from many fantastic features including a modern open plan kitchen/dining room, double garage and a private west facing rear garden backing onto woodland. ENTRANCE HALL Stairs to the first floor, door to the lounge, kitchen, cloakroom and study, understairs cupboard. CLOAKROOM Low level WC and wash hand basin, window to the front aspect. SITTING ROOM 17' 5" x 11' 9" (5.31m x 3.58m) Window to the front aspect, doors to the rear garden, door to the kitchen. STUDY 9' 2" x 7' 1" (2.79m x 2.16m) Window to the front aspect, an ideal study/office space. 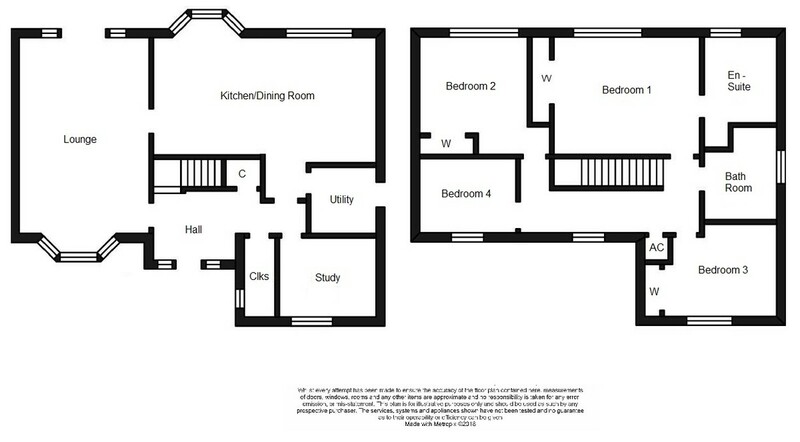 KITCHEN/BREAKFAST ROOM 20' 3" x 10' 5" (6.17m x 3.18m) An open plan kitchen/dining area with windows overlooking the rear garden. A range of modern eye and base level units, space for appliances, fitted cooker and hob, breakfast bar, space for wine fridge, door to the utility room. UTILITY ROOM 6' 7" x 6' 0" (2.01m x 1.83m) Space for appliances, door to the side aspect, sink, wall mounted 'Valliant' boiler. LANDING Loft hatch, stairs, cupboard for storage. MASTER BEDROOM 13' 5" x 10' 10" (4.09m x 3.3m) Built in double wardrobe, door to the ensuite, window to the rear aspect. ENSUITE 8' 0" x 6' 6" (2.44m x 1.98m) Window to the rear aspect, bath, low level WC, wash hand basin, shower unit. BEDROOM TWO 10' 10" x 10' 3" (3.3m x 3.12m) Window to the rear aspect, built in double wardrobe. BEDROOM THREE 10' 2" x 8' 6" (3.1m x 2.59m) Window to the front aspect, built in wardrobe. BEDROOM FOUR 8' 11" x 6' 6" (2.72m x 1.98m) Window to the front aspect. BATHROOM 8' 0" x 6' 5" (2.44m x 1.96m) Low level WC, wash hand basin and bath with shower over, window to the side aspect. GARAGE Two up and over doors, light and power. OUTSIDE The front is laid to lawn with a driveway providing access to the property and double garage. The enclosed and private rear garden backs onto woodland and is mainly laid to lawn with a patio area and greenhouse, all enclosed via panelled fencing.